We mist net regularly on suitable tides (high enough to bring the birds onto the marsh and dark enough to use mist nets) throughout the year, but the most exciting trips are generally in the autumn when the beautiful juvenile birds are just back and you can almost guarantee phosphorescence. As always with mist netting there is anticipation of what you might catch, with the autumn trips sometimes providing less usual birds, such as the Ruff we caught in 2017, Curlew Sandpipers in ‘good’ years and the Broad-billed Sandpiper many years ago. As we extract in the dark you identify the birds by feel, size and shape, and with a little help from any ambient light, every bird is small adventure. Our ‘bread & butter’ (and what we are aiming to catch for our regular monitoring work) when mist-netting is generally Dunlin and Redshank. On our August trip this year, we had a very successful session of mist-netting with a large team, catching over 200 birds, Redshank were by far the most common with an excellent mixture of adults and birds of the year. We also got a good sample of Dunlin (mainly juveniles) and small numbers of seven other species, one of which was a big surprise – an adult Terek Sandpiper – well away from it’s normal flyway! As about a third of the team had caught Tereks on the East Asian-Australasian flyway, we were in no doubt what it was – well you wouldn’t be anyway, would you – what else has such a steep forehead and a bill like that? 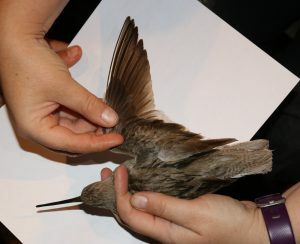 We checked for ring size (we used C2), ringed and processed the bird and took limited photographs and a description (later submitted to BTO and the BBRC) before releasing it back on the marsh. We believe it to be the first Terek Sandpiper to be caught and ringed in Britain & Ireland – indeed only a few (or none) are seen here each year. It was quite fat, so was likely passing through heading south. We can’t help wondering what will happen to it now – will it make it back onto the correct flyway? We hope so and wish it well in it’s unusual travels.